After a few babies arrived that first spring, I quickly learned that I needed a separate spot to keep my kids. Having those active babies running around the herd non-stop was not going to work. 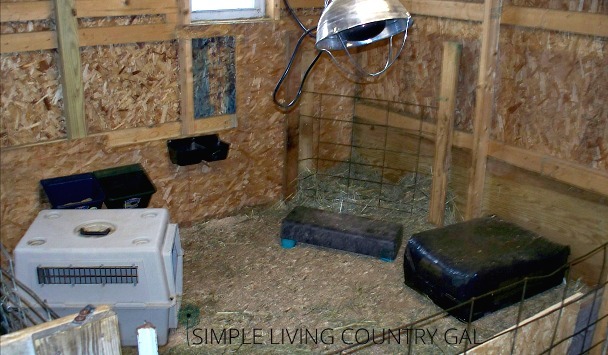 It was time to add a Goat Kid Pen to my barn. So, what exactly is a goat kid pen? Simply put, it is a safe place for the goat kids to play and hang out while mom gets a chance to eat in peace and socialize with the rest of the herd. 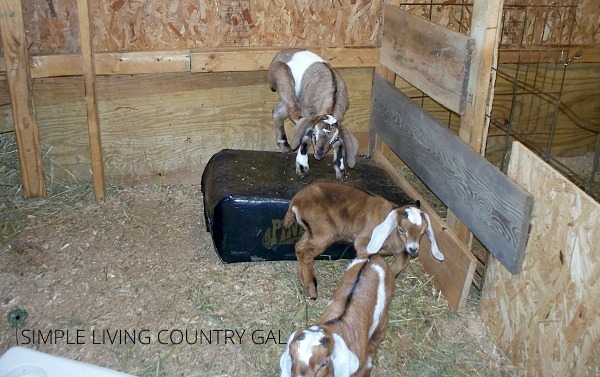 A kid pen for young goat kids is also a vital learning tool for the little ones because they learn socialization with others not to mention a source of entertainment for us! First, you all know enough of me by now to expect this project to be cheap. It was zero dollars to be exact. It isn’t pretty, but it does the trick. 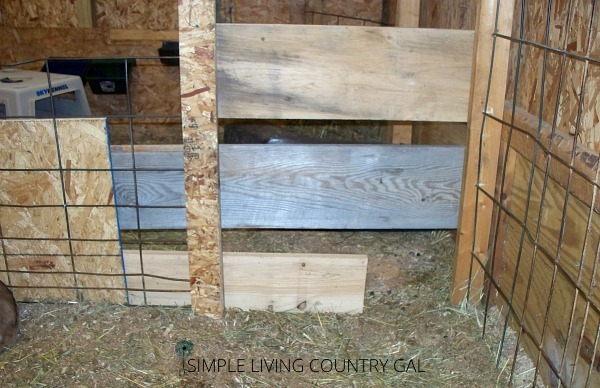 To set up my pen, I sectioned off one end of our goat areas in the barn using hog metal fencing panels (if you have moms that are good jumpers you may want to get cattle panels since they are 2 feet higher). The trick is to make sure the momma goats cannot get in and the babies cannot get out. I put in an opening that only the babies can get through called a kiddie door. You only need a very small opening. I mean VERY SMALL. You would be amazed at what a full-grown doe can squeeze through if she wants to. Last year after starting with a 3′ wide by 2′ tall opening my momma doe, Violet, quickly taught me to change that opening to 1′ by 1′. Have you ever heard the saying, The grass is always greener on the other side of the fence? Yep, that right there was first said by a goat owner. Goats believe beyond a shadow of a doubt that there is something GREAT on the other side of any fence and will try to get to it if they can. You can see in the photo above there is a “gate” I made out of a cattle panel on the right of the photo. This way I am able to close off the kids in the evening – once they are used to be away from mom. 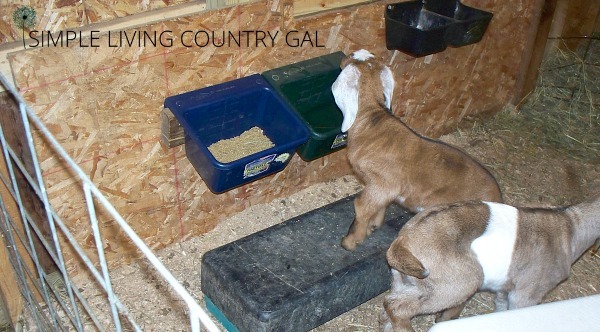 What to put inside of a goat kid pen. Kids love to climb so it is important to supply safe items for them to rough and tumble on. In our case, a bag of wood shavings works perfectly. If they break it open, I have a fresh layer of bedding at the ready! It is also a good idea to have something for them to sleep in. 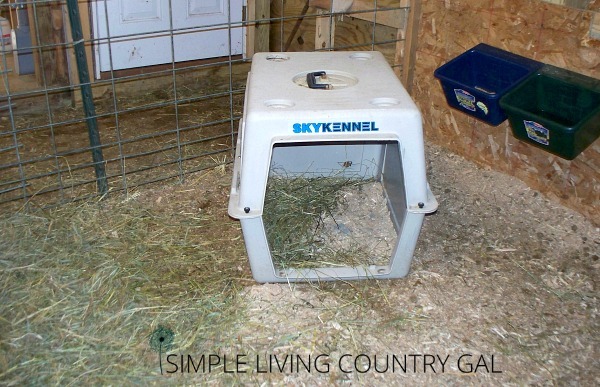 I have a kennel that I fill with hay and a layer of sawdust. I really like the dog “igloos” like this one. At night, they all climb inside to sleep, especially on the frigid nights. You also need to have fresh water available along with kid feed and hay at all times. Don’t worry if they ignore the food and water at first, they will eventually learn where it is and what it is. I use a medicated kid feed to help prevent Coccidiosis. Coccidiosis is a parasite carried by goats. The problem is when there is an overload of that parasite. This can happen quickly in young goat kids that can turn deadly. It occurs most frequently in dirty overcrowded conditions. Prevention is key here, so make sure feed bowls are clean, water is fresh and pens are neat at all times. This is why it is so very important the moms are unable to get into their pen. I use a special medicated feed that is for the babies only and not safe for the mom’s to eat especially if your family is drinking the milk. This is one of the only times I use a medicated feed (other than with my bucks). An ounce of prevention is worth a pound of cure, so even though I do not rely on chemical medications with my herd, this time I do. 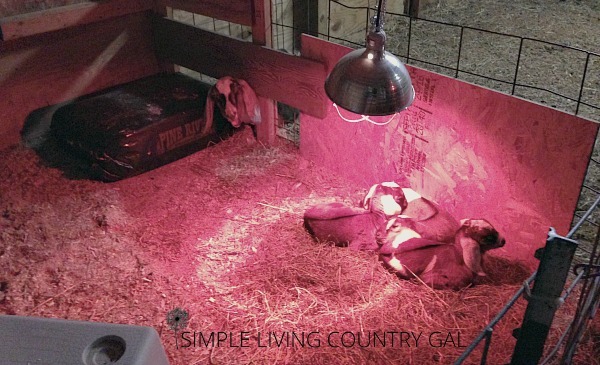 How to keep a goat kid pen warm. If it is cold, a heat lamp is an option you can turn to and will help keep the kids warm, but please use extreme caution if you choose to use one. If you do decide to purchase a heat lamp, choose one with a sturdy guard and take every precaution to ensure the lamp will not fall. Nothing starts fires quicker than heat lamps. And, In most cases, just a simple pile of hay will do the trick. For that reason, I rely on heat lamps only in extremely cold weather conditions. 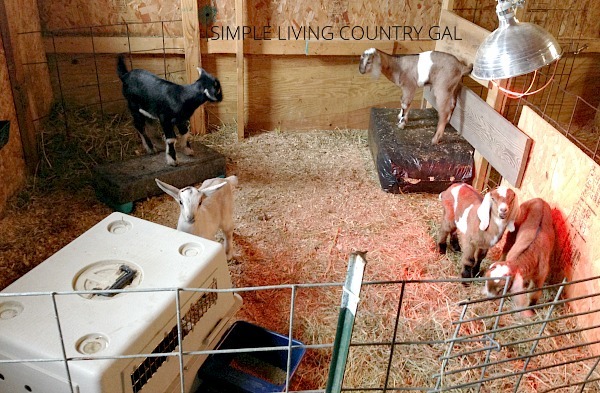 How and when to use your goat kid pen. When the new moms and kids are put back into the herd I have the kid pen opened right away. This is good for the kids to explore things and get used to being in there without mom. More often than not, the kids will begin using it on their own. At two weeks I let the kids sleep in the pen if they choose to do so. The moms are fine since they can see their babies at all times through the fencing. 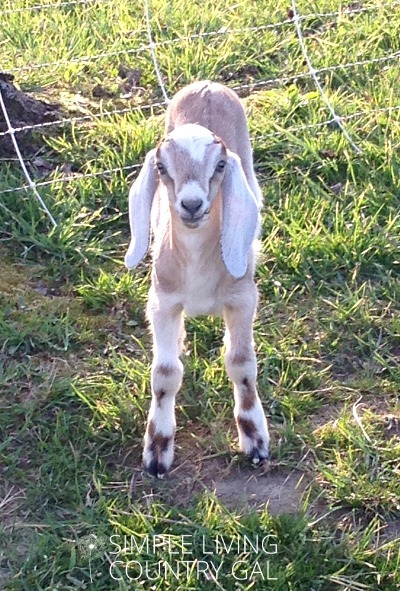 I had a wonderful first freshener a few years ago, that insisted on being in the pen with her doeling. She would sleep the first few hours with her head inside the kid pen keeping an eye on her little one. I do not lock my kids in at night until they are 2-3 weeks of age. This is usually when I start milking my does. Separating the kids from mom at this time during the evening hours helps begin the weaning process and gives our family some milk as well. 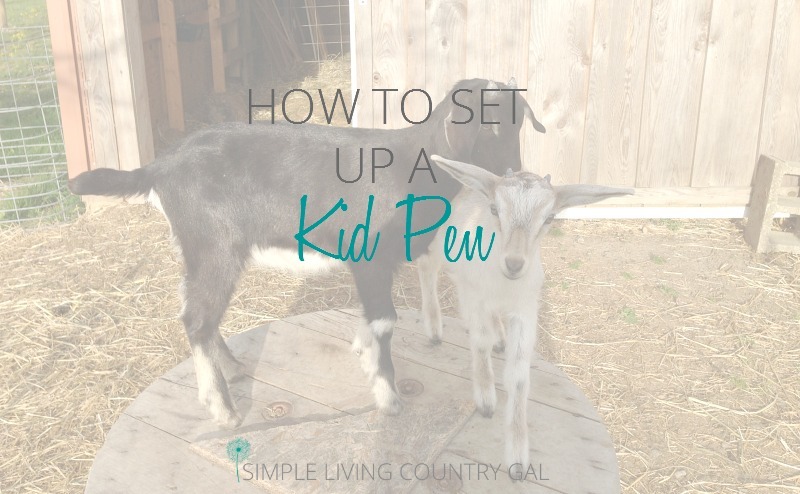 I hope this helps you out a bit, I had no idea what a kid pen was when I first started with goats. I kept my babies in with their mom’s for weeks and I thought that was the right thing to do. Unfortunately, I was doing more harm than good. Now, I understand how important socialization is to goats for both the moms and the babies. Not sure what goat is the best fit for your family? READ: GOAT BREEDS and pick the best one for you! Why do you desperate the kids from the mom so young. We left ours together for over 2 months and had plenty of milk for the family. My doe and feeling screen for each other when young. Too traumatic to separate so young just for humans to have milk. Never ever heard of this before and would never do it. When they when they were weaned we had no problem selling them. No crying. Can only imagine how they must feel. This is the most important time for the kids to be with their mom. Where are the kids and moms for the first two weeks? Last spring was my first kidding season and I was NOT prepared! I am trying to do better this year! My biggest concern is the first few weeks and how to keep babies safe and warm and mama happy.